WINSTON Churchill famously said that, democracy is the worst form of government except for all the others. Indeed when everyone has the opportunity to have a say it can be difficult to keep everyone marching together in the same direction, at the same speed, repeating the same mantra. Of course, getting to the truth often requires alternative opinions to be heard, and perhaps now, finally, the mainstream media will start to allow those sceptical of the theory of anthropogenic global warming to have their say. Indeed just today the Newcastle Herald published the opinion of Anthony Cox explaining how the Australian Bureau of Meteorology homogenise the data. 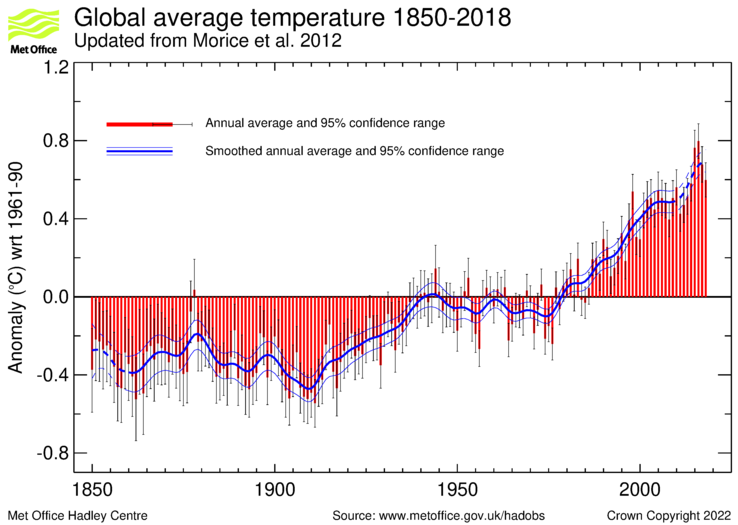 It’s a good article, but was not published in full, and published without a key chart showing the affect of homogenisation on the temperature trend. 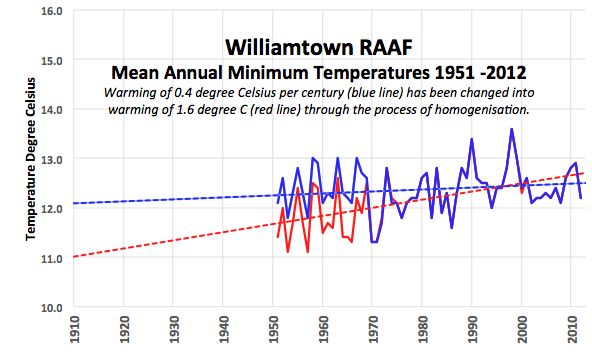 What the chart actually shows is that for the Williamtown RAAF, near Newcastle, the minimum temperature series that begins in 1951 has been homogenised. That is, in the creation of the official temperature series temperatures have been changed from what was originally recorded. Like for Rutherglen in Victoria, and Amberley in Queensland, the temperatures are dropped down starting in about 1971. This has an affect on the overall trend, changing what was a mild warming of 0.4 degree C per century from 1951 to 2012, into dramatic warming of 1.6 degree C per century. Ignoring this new example of homogenisation at Williamtown RAAF, and the 28-pages of ‘adjustments’ released by the Bureau just last week that show most, if not all the weather stations that make-up the official station network are corrupted, the first person to comment at the thread that is now open at the Newcastle Herald is suggesting that I am “cherry picking” and that the overall trend for Australia is surely one of warming. In fact I’ve hardly started with my criticisms, and the overall trend for Newcastle, like the rest of Australia, is very much one of cooling. Let me explain, Williamston RAAF is one of the 112 stations that is used to calculate national trends, but it’s not the best temperature series for the Newcastle region. It only starts in about 1951. 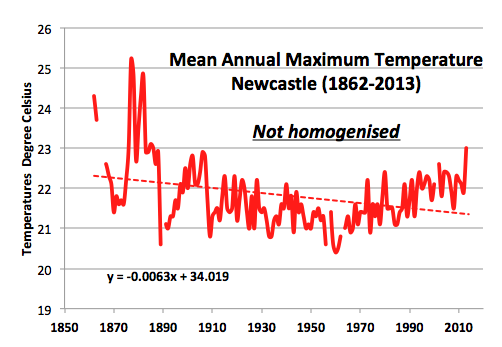 A much more comprehensive record, but one that is conveniently ignored by the Bureau in the development of the official temperature network, comes from the Nobby’s Signal Station, Newcastle. This record starts way back in 1862, and guess what, like most of the really long records it shows that it was much warmer in the late 1800s than for any time since. In fact the hottest years on record are 1877 and 1878. We have been conditioned to believe that temperature have been gradually warming, but this is not what the data shows. When those early records are taken into account, it is clear that New South Wales experienced cooling from the late 1800s to about 1960. After 1960, temperatures across the state and the nation started to increase. This warming continued until it reached a plateau in 2002. Because the warming of the late twentieth century never completely negated the cooling of the early twentieth century, the overall net trend is actually one of cooling. 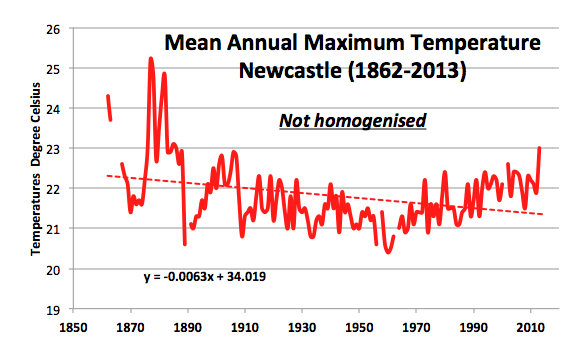 In the case of Newcastle, its a cooling of 0.63 degree Celsius per century. Any comments you can make in this comment thread would be appreciated. After all, in a democracy your vote, your opinion, does count even if it does not accord with popular opinion. Uninformed, and rather nasty comments, are accumulating at both the article at OLO and also at the Newcastle Herald. Those readings for Newcastle Nobbys 1877-8 are pretty striking. It’s interesting to note, in the context of yet another “unprecedented” weather event this year, that Brazil experienced what they call the Great Drought from 1877-9. As bad as this year’s drought has been there, they call that 19th century drought “great” for a reason. Half a million lives lost in northeastern Brazil, 14% of the regional poplulation, 5% of the Brazilian population. The real hazard of not wanting to talk about past climate – like 1877-8 – is that you can start to believe that climate was once stable and benign. Then you start talking about “unprecedented” events and begin to imagine that you can “stabilise” climate if you sacrifice enough goats. Anthony is correct , there is little evidence that Australia has experienced an increased impact from higher co2 emissions since 1950. Sea level rise has not increased at a higher rate at all since 1950 and at least 30 very recent sea level studies show this to be the case. Of course sea levels around Australia were about 1.5 metres higher just 4,000 years ago, because of the much higher temps in the earlier Holocene climate optimum. A 2014 Leclerq et al world glacier study has actually showed a slowing of retreat since 1950. Antarctica has just set new records for increase in ice and the Arctic has increased ice levels in 2014 compared to recent years. 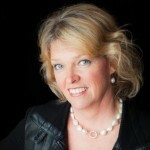 It’s great to see Jennifer Marohasy and others presenting these and other facts at her blog. It was universally hot in 1878 and offers a perfect bench mark. I’ll put this up again to illustrate the anomaly, but I won’t speculate on the cause. The negative comments are appeals to authority, or ad homs. They really do not understand what is going on, or do not want to accept it. I would remind readers that what is happening with the BOM is not without precedent. The Hadley Research Centre and the Climatic Research Unit at East Anglia University is charged with producing the global temperature record. The two main surface temperature records referred to by the IPCC and climate scientists around the world are HADCRUT3 and HADCRUT4. Neither of which incidentally show any statistically significant warming since 1998. That is hardly compelling evidence of dangerous man made global warming since human CO2 emissions have increased exponentially since 1998. Which is of course why the ‘consensus’ of over 100 climate models are miles off in predicting current surface temperatures. But getting back to the CRU: in the late 2000’s many researchers “requested the CRU release the data that underlie its analysis of global temperature trends. Such a request should not at all be controversial. Indeed the atmospheric sciences community went to great lengths in the 1990s to ensure that such data would be openly available for research purposes, culminating in World Meteorological Organization (WMO)Resolution 40 on the international exchange of meteorological and related data and products. Obviously, the ability to do good research depends upon good data with known provenance. At the time WMO Resolution 40 was widely hailed in the atmospheric sciences community as a major step forward in data sharing and availability in support of both operations and research. 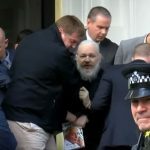 However the CRU went through all sorts of contortions to avoid releasing it’s climate data to researchers including the irrepressible Steve McIntyre at Climate Audit. Pielke and others wondered how the CRU could not hold the data when they are showing graphs of global temperatures on their webpage? Remember, this is the CRU, the GLOBAL equivalent to our BOM! This meant that the world were unable to audit the homogenised and adjusted temperature data being used by the IPCC and all climate scientists around the world. Following this admission and the embarrassing revelations from the Climategate emails the UK Met office, which was responsible for the CRU, announced in Dec 2009, plans to re-examine 160 years of global temperature data. They indicated the new analysis would take at least 3 years. This they indicated meant that the Met Office will not be able to state with absolute confidence the extent of the warming trend until this work is done. I haven’t followed what happened to this review, but perhaps it is not a coincidence that in January 2013 the UK MET office released an updated report confirming that they believe the hottest day in the last 160 years was in 1998, that there had been no statistically significant warming since then, and that they were not expecting any warming to continue until at least 2017 – giving us a non-warming period of 20 years – inconsistent with previous predictions. 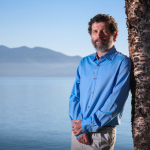 What happens by then remains to be seen, but it shouldn’t be surprising if the world does return to the climate optimums enjoyed during the Medieval Warm Period, The Roman Warm Period and the Minoan Warm Period where humans, and life on the Earth thrived and where it was warmer than today. Unfortunately it does seem that there is a great deal of scientific support for cooling due to the lowest levels of solar activity seen in the last 400 years. The world would not be a happier place at pre-industrial global temperatures. Meanwhile the BOM should cough up the adjustment and homogenisation records before they too accidentally delete or misplace it like their colleagues at the CRU! Bureau of Meteorology falls within his portfolio responsibilities. Jennifer, I notice the second period of high temperatures of your lower graph appear to coincide with “The Great Federation Drought” of 1895-1903 (as described in Chapter 13 of the book “Droughts, Floods and Cyclones; El Ninos that shaped our colonial past”. Donald Johnson, Australian Scholarly Publishing, 2009). Dennis no longer returns my calls. But I still have an egg and a serf. And of course Robert and Neville. You keep me strong. 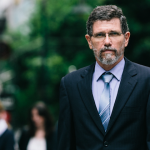 It might even be the case that the mantra chanted after every catastrophic weather event – that it can’t be said to be caused by climate change, but it shows what climate change will do – has become a thing of the past” said Will Steffen, the report’s lead author and director of the Australian National University’s Climate Change Institute. That’s one headless chicken coming home to roost. Serfs fer open society and enquiry, Jen. If the Klimatariat can see signs in the weather, then so can the heretics. Global cooling has a particular fingerprint which shouldn’t be too hard to spot, the hiatus cannot last forever. It could be useful to collate newspaper stories and weather reports to support the temperature record … that high temperatures are not simply bad record keeping or TOB. Steve, it’s that old enemy of life: the high summer westerly in NSW. There had been good rain then dry weeks prior to those 1880 fires, but it looks like the westerly was the prob, far more than heat or lack of rain, just like in the early 1790s, early 80s and around 2000. Common in winter and early spring, the long lasting westerly gale only comes occasionally in summer – but look out when it does. Give me a searing heatwave like Jan 1960 or Feb 2004 rather than a summer westerly. A couple of FACTS for you Peter. 1) Newcastle has NEVER had a BoM site located at the Post Office in Hunter Street (Hunter Mall). 2) Newcastle’s official BoM site is located at Nobbys (station #61055). 3) Nobbys is a lighthouse located at the entrance of Newcastle Harbour unaffected by UHI. 4) Nobbys has continuous weather data dating from 1862 to present. 5) Nobbys has not had a station move since it was built in 1862. 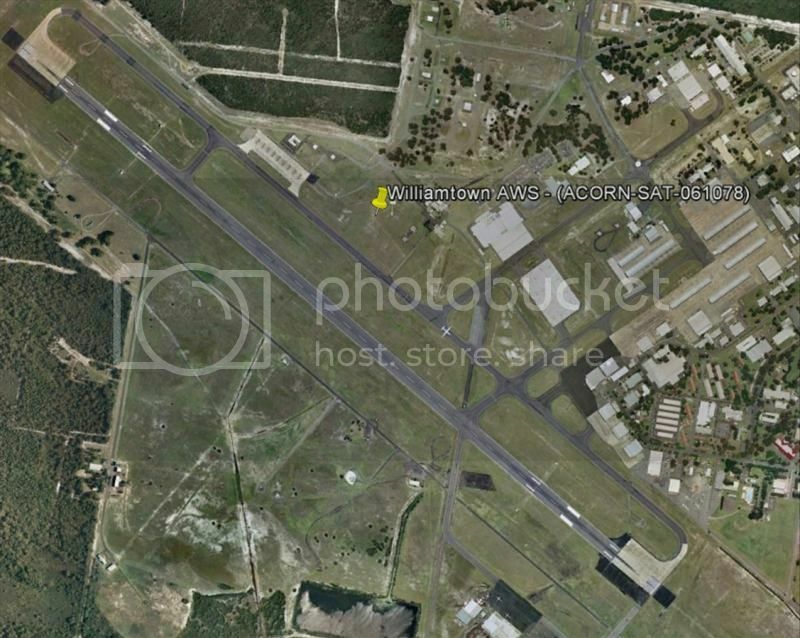 6) Williamtown has only been in operation since 1942, when the RAAF base was built. 7) There was a site move of about 250m on 15 February 2005 at Williamtown. Oh, one other thing……..I have lived in Newcastle my entire life……52 years. The “adjustment” of the RAAF data looks like it was triggered by the biggish (though only just over 1C) drop in temperature around 1970. The algorithms then probably looked at the other data, which shows warming and no drop at that time. A human analyst then probably OK-ed the algorithm making the adjustment. There is the obvious potential for warming confirmation bias to have led to incorrect adjustment post-1951 and truncation of the pre-1951 data. One bit of physics may be relevant here. It may the case that drought causes temperatures to rise slowly over many years as soil moisture falls slowly, but when droughts end the temperatures may fall quickly following rain. Thus, some sudden drops in temperature may be natural and should not be adjusted. Might be worth checking the rainfall figures at the RAAF station. Urbanisation probably has a similar effect, slow warming over many years, sometimes followed by a sudden drop when the station is moved to a more rural location. 2. At the end of every drought there is a good rain. And I will have a bet with anyone of you that tomorrow will be either hotter, the same or cooler than the average for this time of the year. I’m amazed that Anthony Cox was able get that article published in the Newcastle Herald – it’s normally global warming heartland. The comments seemed to be running in your favour by a good margin when last I looked. That surprises me too. Normally anyone who even intimates any scepticism of the party line is torn to shreds there. Perhaps there are many closet skeptics amongst the Herald readership who needed something like this to kick-start their activism. Keep sticking it to the BOM and its apologists. From the BoM website there was indeed 2-3 times the average amount of rainfall at Williamtown in December 1970 to Feb 1971. It might not have been this rainfall that caused the sudden cooling DIRECTLY, but it may reflect a change of weather pattern that was the cause. This suggests that the original Williamtown data may be more plausible than the adjusted. It really needs an experienced unbiased analysis of ALL the meteorological data. The BOM homogenization of the records at Newcastle demonstrate the “trick” used by BOM and other providers of temperature series to create a warming trend by replacing or swamping long run records that often show cooling or a low warming trend with short records from the lows of the 1950´s that give a large warming trend by picking the upslope of the natural sine wave. As I pointed out in an earlier comment, the BEST climate site gives details of some 180 stations in Australia with continuous or near continuous temperature records of over 100 years, many of which have cooling trends. Of these, some 75 have Tmin and Tmax records for the same periods. As Tmin and Tmax are important in determining the causes of any temperature change, as reflected in DTR values, it is critical that stations used in the compilation of a series such as BEST, CRU, GISS, NCDC and Acorn are based on such records alone. Yet Acorn, that BOM claims is based on the best available records, uses only 26 of the BEST sites with 100 years of Tmin and Tmax data; instead using other sites where the Tmin and Tmax records only run post 1940 and for 55 of their 112 stations using sites that only started recording temperatures at all from this time onwards. It is this cherry picking of start dates, and ignoring long term records like Nobby´s Signal Station, that enables the creation of artificial long term warming trends. It is time to see if other national temperature data bases have been handled in this manner. Thank you so much for your work in pushing this forward. Hunter, I have been able to ducument New Zealand, the US, and Switzerland. Plus that Iceland has not fiddled its records. I have also been able to to document that the NOAA GHCN, the NASA GISS, and the HAdCRT4 have all fiddled global temps just like BOM has for Australia. For the same faulty homogenization reasons. Two flawed assumptions, regional expectation and Menne stitching are present in virtually all ‘standard practice’ homogenization algorithms. BEST is probably the ‘best’ temperature source. Is available on line at Berkeley earth project. They still get it wrong sometimes, but a lot of GHCN fiddles stations like Rekyavik Iceland, Sulina Romania, and DeBilt Netherlands they seem to have about ‘right’ both historically and in the satellite era. Details with footnotes are in a chapter of my forthcoming ebook. I note with Bourke in Western NSW they have the airport opening in 1871 (this predates the Wright Brothers and their first flight in 1903). In fact what they start with is an already homogenised series from the BOM (originally Bourke post office, retagged with an airport label when homogenised by the BOM) and then treated as raw by BEST, before homogenising. They operate without even a brain. I’m intrigued by your comment… Of course the original Williamtown data was “more plausible”! As a scientist you don’t choose the most plausible data (original or remodelled), you stick with the data as recorded and attempt to explain it. It is simply not science to change the received evidence. If the BOM science managers want to write a paper about a method for the remodelling of the data… they are entitled to do that. But instead, they remodel the data and then insert it as the actual recorded temperature series. In 1999 Hansen admitted there had been little warming according to their record. In fact he admitted that droughts were not as bad as earlier periods and also stated that the 1930s were warmer than temps up tp 1999.
http://www.giss.nasa.gov/research/briefs/hansen_07/ So how can this change since 1999 and after we have seen 15 years of no SS warming??? “What’s happening to our climate? Was the heat wave and drought in the Eastern United States in 1999 a sign of global warming? So what gives with these people? Since this was written we’ve had a pause or hiatus and yet this bloke has become the most extreme alarmist. This is an even bigger scandal than the BOM mess yet nobody wants to know about it. And indeed what has happened to their data over the last 15 years???? I should have made clear that he was comparing USA temps up to 1999 to the rest of the world in the above comments. More fake temp data from GISS. They now state that August 2014 was the hottest since 1881. But RSS shows this is absolute BS. Will this corruption of the data ever stop? I wondered if the description of methodology adopted for Met. readings, as described in ‘The Goulburn Herald’ (NSW:1881-1907) of Friday 26 January 1900, P.4 [ex Trove], also applied to any other places/sites around Australia? This appeared to be the most comprehensive report on adopted methodology that I could find on Trove, using the simple search term “Stevenson screen”, although there was an earlier reference to the same site in the ‘Illawarra Mercury’ (Wollongong, NSW:1856-1950) for Saturday 19 February 1898, P.2. Plus, of course, many other references to Stevenson screens – including Tenders undersigned by King O’Malley. Keep on hammering, Jen – the work that you, Ken (up north of here) and all the other fine contributors are doing must eventually have an impact and cause people to open their eyes and hopefully have their brains doing some logical thinking – and not simply believe, so blindly, what they are told. Slightly O.T. – It is a great pity that, in your work towards better rainfall forecasting, our grandparents and gt grandparents weren’t still around to pass on their understanding of the indicators they used in their day to day life as very successful farmers, particularly leading up to and during the major drought years of the past. Jennifer, I said BEST gets it wrong sometimes. Appears I was wrong about how often sometimes. I only checked against some egregious GHCN homogenizations previously published and equivalent to Rutherglen. Over to you for more on Australia. As an old retired lawyer ignorant of science,without your help, I have no way of questioning the story which has been sold to us by what appear to be scientists clouding judgment with self interest.. I first had doubts when I read The Voyage of the Beagle. Darwin noticed what appeared to be rising of sea level in Cocos Islands. It was evidenced by coconut tress falling into the sea. Darwin thought it was explained by shifting of plates and related it to his finding sea shells a thousand feet above sea level in South America. 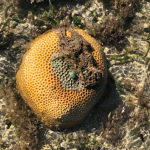 The accepted present theory, certainly believed by islanders in the Pacific and Indian Oceans now claiming compensation, appears to be that sea levels are rising because of anthropogenic warming. Perhaps Australia should open up its borders to islanders badly affected , but not because of guilt. Humanity is enough. In the meantime I have no intention of feeling guilty for being part of the first world which has created huge wealth by burning carbon. It is that wealth without which 90% of the world’s population, rich and poor, would not exist today for lack of the means to produce transport and distribute the food and shelter needed to sustain life. More on the creeping gradualism of the GISS data set. Bob Tisdale explains how the GISS people never give up and they are always tweaking the trend up, even over a period of just a few months. What’s wrong with the people in the USA, why don’t they demand a halt to this corruption? So, a couple of days ago, a link was posted reporting that Tim Flannery was heading to Broken Hill for A Global Warming jamboree & hoe-down. Needless to say, BoM homogenised doomsday warming was Flannery’s schtick. But, it is the people who attended, and their climate stories that readers here will enjoy. “Lynne Gall from Langarwirra Station, 120 kilometres from Broken Hill, says the forum was a good opportunity to think about climate change and to ask questions. “Interestingly enough, I’ve got a diary written by a woman who lived in this area in the early 1800s. “HISTORIC Roseberth Station on the banks of the Diamantina River near Birdsville is in the grip of the worst drought since the 19th century. The three-year drought, which has hundreds of western Queensland farming families in a death grip, has hit hardest around the state’s southwest. Mr Morton said the drought followed a flurry of good seasons which ended at the start of 2011, although the country held on for a year on the back of good rains. This week locals were putting their hope in summer rains, which often arrive as late as February. Fishermen in the few water holes left in the Diamantina have been cheered by finding roe in the bellies of caught yellowbelly fish, a sign the fish expect the river to soon rise. IT’S a testament to the management skills of Don Langford and his forebears that Waterbag Station has never had to de-stock in the 85 years the family has owned and run it. I’ve had a quick look at the MIN data for the stations cited by BoM in their adjustment in 1969 (see post above). 61087 (Gosford), 60030 (Taree), 67035 (Liverpool Whitlam). Based on this quick look I’d say the BoM adjustment has no validity. The adjustment appears to have been triggered by the sudden drop in MIN temperature in 1970, but as that drop was probably genuine the adjustment process should have been stopped at the point of detection. Yes the adjusted data still shows a drop in 1970, but it was a false detection, and surely data should not be adjusted following false detections, especially using data from over 100 km away and over 100 km further inland from a temperate coastal location in which climate has considerable spatial variability. There’s this story on the ABC from 2013 on Algernon Belfield, who kept detailed weather records for 40 years from 1878 in New England. That is a point not lost on Bill Oates from the University of New England. “Suddenly amidst all these records you find this one particular run of really detailed methodical weather record keeping that sits on this continuous run for 40 years,” he said. As well as the detail that Algernon Belfield kept, the importance of his work is the time these records were taken. The Bureau of Meteorology officially started standardised records in 1910, and they did not start in the New England district until 1961. 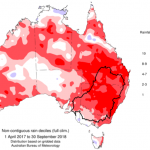 Martin Babakhan from the University of Newcastle does a weekly forecast for farmers and says the data are helping him and others better predict weather here in Australia. “We are coming up with the tools to give ourselves the best forecasting weather patterns for farmers,” he said. Excellent catch Steve, here is a link to the trove. An important post by Jo Nova here, also on Newcastle.. There is an Open Thread for O/T comments. Please desist from posting them here. When leftist academe comes up with an acronym like “BEST”, you know it is the WORST! AGW theory believe they have a great interest in nature, and the natural sciences. Many would claim to be ‘well educated’. How ironic that they put their faith in ‘climate models’ that are clearly dysfunctional. In the real natural world, the weak and infirm quickly become food for those higher up the food chain. How many of the climate models nave demonstrated the reliability that would allow them to survive in nature. Some California history buffs claim that Lyman Gilmore, of Grass Valley, California, beat the Wright brothers to the punch. However that’s been difficult to document. My understanding is that for many years, Gilmore’s aircraft had been sitting in a hanger, which was destroyed by fire in the hot 1930s. There may have been a political factor in giving the Wright brothers the nod. Their aircraft was more like conventional propeller-driven planes. In contrast, Gilmore’s aircraft was STEAM-powered. The residents of Grass Valley are openly sceptical of the official story about the Wright brothers. The city even named a school after Gilmore. Here’s a news item from last year. Gilmore or Wright…Who was First? “Today is the 111th anniversary of Lyman Gilmore’s first airplane flight and the students from Grass Valley Schools are celebrating all day. KNCO’s Gary Jacobson is on campus and says the celebration includes a flyover of vintage airplanes. Tony Heller still insists that the raw temp record for a majority of USA temp stns show cooling. But adjustments lower past temps to show a warming. Who is correct, Gavin and his team or Tony Heller? The Hockey Schtick tries to school a fool about the science of co2 and temp and other bogus nonsense about warming/hiatus etc since the LIA. One of their best posts for months IMHO. Many links provided. As an outsider, my general impression is that this is par for the course for Australia. On the other hand, Steve Goddard makes the point that the warmest temps in recent history for the contiguous USA as a whole were in the 1930s. However California’s Death Valley National Park hit the record books in 1913. Even these days, tourists who visit Death Valley in the Summer, don’t need to bother with sunscreen. Smearing your hide with barbecue sauce would be more to the point! If the world really is in a long term cooling trend, would it be asking too much of Mother Nature for her to arrange all the major regions to be in lockstep? The ‘may haves’ do not justify changing a slight cooling trend to a warming trend at Rutherglen. There was nothing wrong with the way those records were kept before those ‘may haves’. If you know Rutherglen & surrounds then you would understand that the ‘may haves’ do not justify comparing with stations from locations in other regions. BoM’s focus on trying to neatly package Australian weather/climate into a statistical trend is not proving to be at all useful for people who work in the REAL environment/weather/climate and has the very real potential to mess up further research into Australian weather/climate. The raw data and the ‘packaged’ data should not be so different & does nothing to help inform the people of Rutherglen. The same applies to all the other stations with long records. As Debbie said and I maintained for ever, creating a neat package of data is meaningless and a distortion by necessity. Why not just do a station by station trend and then create a trend table by region. In theory the actual numbers are meaningless only the trend matters.